4 kruiser dan 6 pembinasa tenggelam. 1 pengangkut pesawat, 2 kapal tempur, 4 kruiser, 2 pembinasa, 1 kapal selam rosak. 284 pesawat Luftwaffe musnah atau ranap dan beratus lagi rosak. Pertempuran Kriti (Jerman: Luftlandeschlacht um Kreta, Bahasa Yunani: Μάχη της Κρήτης, juga dikenali Unternehmen Merkur (Operasi Mercury), telah berlaku di pulau Kriti, Yunani semasa Perang Dunia Kedua. Ia bermula pada pagi 20 Mei 1941, apabila Jerman Nazi melancarkan serangan hantaran udara ke atas Kriti. Tentera Yunani, tentera Berikat yang lain serta dengan penduduk awam Kriti mempertahankan pulau tersebut. Selepas sehari pertempuran, pihak Jerman telah mengalami mangsa korban yang sangat banyak dan tentera Bersekutu yakin bahawa mereka mampu mengalahkan pencerobohan itu. Keesokkan harinya lapangan terbang Maleme di barat pulau tersebut dimusnahkan akibat kegagalan komunikasi, taktikal Bersekutu yang teragak-agak dan operasi penyerangan Jerman. Perkara tersebut membolehkan pihak Jerman mendaratkan pasukan bantuan dan mengatasi posisi pertahanan di utara pulau ini. Tentera Berikat berundur ke pantai selatan. Lebih separuh telah dipindahkan oleh Tentera Laut Diraja; yang selebihnya menyerah diri atau menyertai Penentang Kriti. Pertempuran ini merupakan pertempuran pertama yang menggunakan Fallschirmjäger (Askar payung terjun Jerman) secara besar-besaran, pencerobohan besar hantaran udara pertama dalam sejarah ketenteraan, pertama kali pihak Berikat menjadikan signifikan penggunaan risikan dari penyahsulitan perutusan-perutusan Jerman dari Mesin Enigma dan kali pertama tentera Jerman mendapat tentangan besar-besaran daripada orang awam. Bilangan korban tinggi daripada pasukan payung terjun Jerman menyebabkan Adolf Hitler melarang operasi besar hantaran udara yang seterusnya. Sebaliknya, pihak Berikat kagum dengan potensi pasukan payung terjun dan mula membentuk serangan airborne dan rejimen pertahanan lapangan terbang. ^ Stephen, Martin (1988), Sea Battles in Close Up World War 2, 2, Naval Institute Press, m/s. 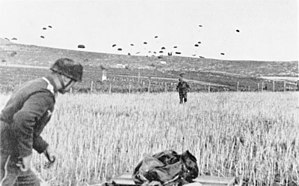 53, ISBN 1-55750-758-9, One way of dealing with Malta would have been an airborne invasion but Hitler would not countenance such a thing, especially after the pyrrhic casualties of the Crete victory. ^ Buell, Thomas; Greiss, Thomas (2002), The Second World War: Europe and the Mediterranean, Square One Publishers, m/s. 101, ISBN 0-7570-0160-2, The rank and file on both sides fought tenaciously on Crete, and in the end the Germans could claim only a pyrrhic victory. ^ Wright, Robert; Greenwood, John (2007), Airborne forces at war, Naval Institute Press, m/s. 9, ISBN 1-59114-028-5, The seizure of Crete was a strategic but Pyrrhic victory for Germany that was brought at the price of future German airborne operations. ^ Long 1953, halaman 210. ^ Maloney, Shane (Julai 2006). "Bogin, Hopit". The Monthly. Naval Operations in the Battle of Crete, 20th May – 1st June 1941. Naval Staff History, Second World War. Battle Summary. BR 1732 (2) (edisi rev.). London: Admiralty Historical Section. 1960 . OCLC 224008525. Buckley, Christopher (1952). Greece and Crete 1941. Second World War, 1939–1945; a popular military history. London: H.M. Stationery Off. Carruthers, Bob (2012). Blitzkrieg in the Balkans and Greece 1941. Coda Books. ISBN 978-1-78158-122-3. Davin, Daniel Marcus (1953). Crete. The Official History of New Zealand in the Second World War 1939–1945 (edisi New Zealand Electronic Text Collection (online)). Wellington, NZ: Historical Publications Branch, Department of Internal Affairs, Government of New Zealand. OCLC 1252361. Dicapai 4 November 2015. Gill, George Hermon (1957). Royal Australian Navy, 1939–1942 (PDF). Australia in the War of 1939–1945, Series 2, Volume I. Canberra: Australian War Memorial. OCLC 848228. Dicapai 24 November 2015. Hinsley, F. H. (1994) . British Intelligence in the Second World War. Its influence on Strategy and Operations. History of the Second World War. abr. (edisi 2nd rev.). London: HMSO. ISBN 0-11-630961-X. H. M. Ships Damaged or Sunk by Enemy Action, 1939–1945 (PDF). No ISBN. London: Admiralty: Director of Naval Construction. 1952. Dicapai 24 November 2013. Joseph, Frank (2011). The Axis Air Forces: Flying in Support of the German Luftwaffe. Santa Barbara, California: ABC-CLIO. ISBN 978-0-31339-591-8. Long, Gavin (1953). Greece, Crete and Syria. Australia in the War of 1939–1945. Series One – Army. II (edisi 1st). Canberra: Australian War Memorial. OCLC 3134080. Dicapai 4 November 2015. Playfair, Major-General I.S.O. ; Flynn, Captain F.C. ; Molony, Brigadier C.J.C. & Toomer, Air Vice-Marshal S.E. (2004) [1st. pub. HMSO 1956]. Butler, J.R.M, penyunting. The Mediterranean and Middle East: The Germans come to the help of their Ally (1941). History of the Second World War, United Kingdom Military Series. Volume II. Naval & Military Press. ISBN 1-84574-066-1. Richards, Denis (1974) . Royal Air Force 1939–1945: The Fight At Odds. I (edisi paperback (online)). London: HMSO. ISBN 0-11-771592-1. Dicapai 4 November 2015. Roskill, S. W. (1957) . Butler, J. R. M, penyunting. War at Sea. History of the Second World War United Kingdom Military Series. I (edisi 4th impr.). London: HMSO. OCLC 881709135. Dicapai 4 November 2015. Taylor, Nancy Margaret (2004) . "8 Blood is Spilt". The Home Front. The Official History of New Zealand in the Second World War 1939–1945. I (edisi New Zealand Electronic Text Centre (online)). Wellington, NZ: Historical Publications Branch, Department of Internal Affairs, Government of New Zealand. OCLC 226971019. Dicapai 4 November 2015. The German Campaigns in the Balkans (Spring 1941). Dept of the Army Pamphlet. Washington, DC: Dept. of the Army, Office of the Chief of Military History. 1952. OCLC 43416304. Dicapai 4 November 2015. The Rise and Fall of the German Air Force. Air 41/10 (edisi Public Record Office War Histories). Richmond, Surrey: Air Ministry. 2001 . ISBN 1-903365-30-9. Axelrod, Alan (2008). The Real History of World War II: A New Look at the Past. Sterling Publishing Company. ISBN 1-4027-4090-5. Barber, Laurie; Tonkin-Covell, John (1990). Freyberg : Churchill's Salamander. London: Hutchinson. ISBN 1-86941-052-1. Cody, J. F. (2004) . 28 Maori Battalion. The Official History of New Zealand in the Second World War 1939–1945 (edisi New Zealand Electronic Text Centre [online]). Wellington: Historical Publications Branch. OCLC 173284168. Dicapai 5 November 2015. Elliot, Murray (1992) . Vasili: The Lion of Crete. London, Australia, South Africa (edisi Greek paperback edition Efstathiadis Group S.A.). New Zealand: Century Hutchinson. ISBN 960-226-348-2. Harokopos, George (1993). Spilios Menounos, penyunting. The Fortress Crete 1941–1944 The Secret War 1941–1944: Espionage and Counter-Espionage in Occupied Crete. English translation: B. Giannikos & Co., Athens (edisi Greek paperback). Seagull. ISBN 960-7296-35-4. Keegan, John (2003). Intelligence in War: Knowledge of the Enemy from Napoleon to Al-Qaeda. ISBN 0-375-40053-2. Kokonas M. D., N. A. (1993). Leigh Fermor, P., penyunting. The Cretan Resistance 1941–1945: The Official British Report of 1945 Together with Comments by British Officers who took part in the Resistance (edisi Greek paperback edition Graphotechniki Kritis, Rethymnon, Crete, Greece). London. ISBN 960-85329-0-6. Kurowski, Frank (2010). Jump into Hell:German Paratroopers in World War II. Stackpole Books. ISBN 978-0-8117-0582-0. Lind, Lew (1991). Flowers of Rethymnon: Escape from Crete. Kangaroo Press. ISBN 0-86417-394-6. Moorehead, Alan (1941). Mediterranean Front. London. Stanley Moss, W (1950). Ill Met By Moonlight: The Story of the Kidnapping of General Karl Kreipe, the German Divisional Commander in Crete. New York: The MacMillan Company. Psychoundakis, George (1991) . Patrick Leigh Fermor, penyunting. The Cretan Runner: His History of the German Occupation (edisi Greek paperback edition: Efstathiadis Group S. A.). London. ISBN 960-226-013-0. Ross, A. (2004) . 23 Battalion. The Official History of New Zealand in the Second World War 1939–1945 (edisi New Zealand Electronic Text Centre [online]). Wellington: Historical Publications Branch. OCLC 173284126. Dicapai 5 November 2015. Saunders, Hilary St. George (1959) . The Green Beret: The Commandos at War. Four Square Books. London: Landsborough Publications. OCLC 503725176. Thomas, David A. (1980) . Crete 1941: The Battle at Sea (edisi Greek pbk edition (in English): Efstathiadis Group, Athens). London: Andre Deutsch. OCLC 11023583. Wikimedia Commons mempunyai media berkaitan: Pertempuran Kriti. Power, Graham. "The Battle of Pink Hill". Power Publishing. Diarkibkan daripada yang asal pada 25 May 2010. Dicapai 13 June 2010. Laman ini diubah buat kali terakhir pada 14:37, 1 Januari 2019.